HARDIN COUNTY — Jerry McBride’s farm at 11312 County Road 60, Dola, will be the site of a Hardin County Twilight Tour program. This program, focusing on farm solar power, will be held Thursday, July 16, from 7 to 8:30 p.m. The event will allow time to see first-hand a recently installed and operating solar power system, which is mounted on the roof of the local farmer’s barn. There will also be a presentation inside the barn, so attendees are asked to bring along lawn chairs. Participants can also bring a copy of their electric bill to the program if they would like a basic solar assessment provided at no charge. There is no cost or pre-registration to attend, and refreshments will be provided. 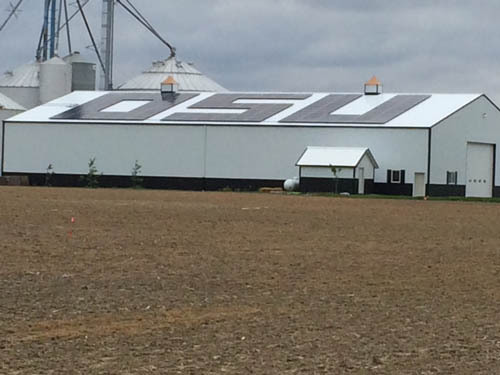 OSU Extension resources will be provided on On-Farm Solar Electric Systems, On-Farm Solar Site Assessment, Estimating the Size of a Solar Electric System, and Financial Considerations of On-Farm Renewable Energy. Farmer Jerry McBride will be available to answer questions about the decision making process and issues he has faced when determining the need, installation, and operation of his farm solar power system. Jess Ennis, senior director for solar power developer Ecojiva Solar, the company which worked with McBride’s on-farm solar system, will be a presenter for the evening. Ennis, who is from Hudson, is very proud of the OSU solar array the company developed for McBride. Jess did his graduate studies in agricultural economics at The Ohio State University; his parents met at OSU, and his son is a third generation Ennis Buckeye, now studying chemical engineering. Jess says he won’t rest until every farm in Ohio is generating its own electricity with solar power. Solar power developer, Ecojiva Solar, has installed more than fifty solar power systems for farmers and rural businesses in a dozen northern Ohio counties. Combined, these systems produce more than two million kilowatt-hours of electricity annually, enabling their owners to take control of escalating electricity costs by producing their own power directly from sunlight. Ennis’ presentation will focus on how solar power helps farms and businesses seize control of electricity costs. He will discuss solar power basics, including replacing purchased electricity with energy generated on the farm. Just like the leaves of corn plants convert sunlight into usable energy, so do solar panels. The components that make it happen and the output they produce will be explained. His illustrated talk will also explain how no batteries are needed with today’s on-farm solar systems. Producers can “sell” their excess energy back to the utility. Sizing a solar power system to individual farm needs will also be a topic. Additionally, the incentives involved, including tax credits, accelerated depreciation, and USDA grants have never been stronger. Ennis will address how to apply them to cut the cost of a solar power system by 80-some percent. Finally, he will answer questions about Jerry McBride’s system and other real-life examples on Ohio farms.